Narbonne is one of those European cities with evidence of its past on every street. This important Roman city was adopted in the Middle Ages, with multiple cases of re-use. One example includes the Roman subterranean grain storage chambers known as the Horreum used as medieval cellars. The Via Domitia, one of the main Roman roads in France, is preserved under the modern city and you can walk on a small excavated section next to the main cathedral. The historic city centre is strategically located by natural river crossings and in the past was encompassed by Roman and medieval walls. The Cathedral of Saint-Just et Saint-Pasteur was built in the rayonnant, or High, Gothic style between 1272 and 1340 and was never completed. It is the highest Gothic choir in France, reaching over 40 meters high. The flying buttresses are doubled in some sections, to help support the height and the numerous lancet windows. The archbishop’s palace and cloister are directly adjacent to the cathedral and the palace can be toured as a historic museum with exhibits on the history of the city. The 14th century cloister is a free garden park and is open for visiting during regular business hours. During my visit in May 2017, it was partially renovated and work was ongoing to improve the gardens and replace some of the degraded masonry. It seems likely that there was a 4th century basilica on the same location, however Gallic records of a fire in 441 a.d. led to the construction of a new church in 445 a.d. A Carolingian church with a cloister followed that, then in 1268 Pope Clement IV (formerly Archbishop of Narbonne) issued orders for a new monument. The choir of the cathedral, the only completed section, contains multiple medieval tombs. Several archbishops of Narbonne lie close to the altar, with vivid 14th and 15th century polychromy and evidence of Revolutionary damage. The tomb of Pierre Cardinal de la Jugie, Archbishop of Narbonne from 1347-1357, retains a painting of the deceased being lifted into heaven by angels (see below), while rows of saints and other clergy support his bed. The gisant is missing, but the rich colors remain. The ornate detail is reflective of the French High Gothic style. 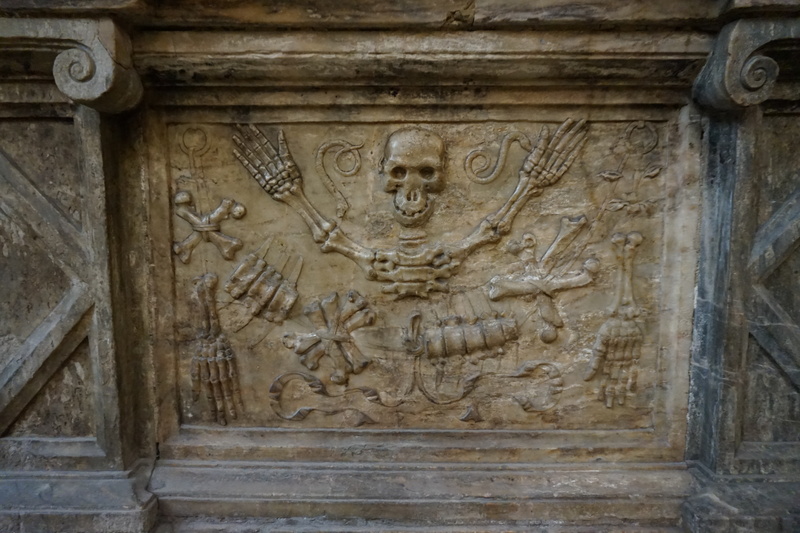 This tomb contrasts nicely with the blend of medieval and Renaissance motifs on the tomb of Guillaume Cardinal de Briçonnet, Archbishop of Narbonne from 1507-1514. His tomb was installed in 1523, and the revival of the Classical elements is evident in the columns, naturalistic floral details, and putti. A strong medieval flavor remains in the somewhat crudely carved mourners along the lower course, their sad and pained expressions leaving the viewer wondering if they mourn for the departed Guillaume or suffer from a personal malady. Panels below the mourners have dancing death’s heads in a unique mix of medieval and Renaissance. While the medieval aesthetic loved a good Death image, these grinning skulls with the articulated skeletal hands more closely resemble the skeletal tomb adornments of the 17th and 18th centuries. In the Chapel of Our Lady of Bethlehem, a remarkable collection of 14th century decorative carvings has been reassembled after being damaged in the French Revolution. Narbonne was the site of many skirmishes in the Revolution and decorative elements in many of the city’s churches reflect damage from this period. In this apsidal chapel, a high relief triptych displays the journey of Mary into Bethlehem is accompanied by angels and saints including Just, Pasteur, Peter, and Paul. The lower course shows grotesque scenes of Purgatory, with the Devil seated inside the gaping mouth of a demonic creature. Wall paintings accent the high relief figures and much of the medieval paint is visible throughout the entire collection. The Mary and Child sculpture is well-preserved, with only small bits like Mary’s right toe and Jesus’ right hand missing. Her flowing gown is nicely draped and both figures bear a peaceful expression. At this point, don’t think you’ve seen it all. You’re not even close to being done with your medievaling at this place! Keep ambling around the choir to the Treasure of the Cathedral and climb the short staircase to a small but stunning gallery of medieval treasures. Notable items include a 9th century ivory plate, about 4 x 5 inches (enormous for an ivory like this one! ), an 11th century ivory pyx, and a 14th century painted wooden reliquary with intact paint. The ivory plate and the pyx both have unique stories. The plate was likely carved in the school of the Palace of Aix-la-Chapelle before 815 a.d. The pyx bears an Arabic inscription recording its creation in Cuenca (modern Spain) and the man who first commissioned it (Ismail, governor of the Taifa territory). Other items also deserve time and observation, however don’t miss the unique acoustics of the domed ceiling. If you’re traveling with friends, stand in opposite corners and whisper into the wall. The sound will carry around the dome and your friend will hear every word perfectly. If you really want to pour over every detail in the cathedral, allow at least an hour for a visit. It is an actively used church and the many chapels will likely have worshipers present. Be respectful. The cathedral and chapels are free to visit however the Treasure tower is 4€ or included with a multi-site tourist pass available in Narbonne.